Measuring roundness for tall parts hasn’t been easy, or inexpensive – until now. With one of the most complete lines of roundness gages available, we’ve filled the void for handling tall parts without added expense or the programming expertise required on CNC controls and other gages. 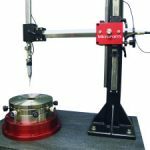 Our mid-sized mini-tower based gages incorporate easy-to-use manual probe setup to quickly and easily measure tall parts with unmatched repeatability. 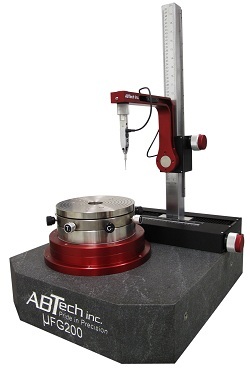 Our roundness gages incorporate an ABTech designed and built air bearing rotary table that delivers ultra-precision results. A powerful yet intuitive user interface simplifies navigation, displaying the results in a familiar way. 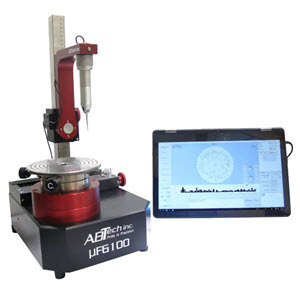 These ease-of-use features allow operators of all skills levels to take exacting measurements on the shop floor or in the QC lab. 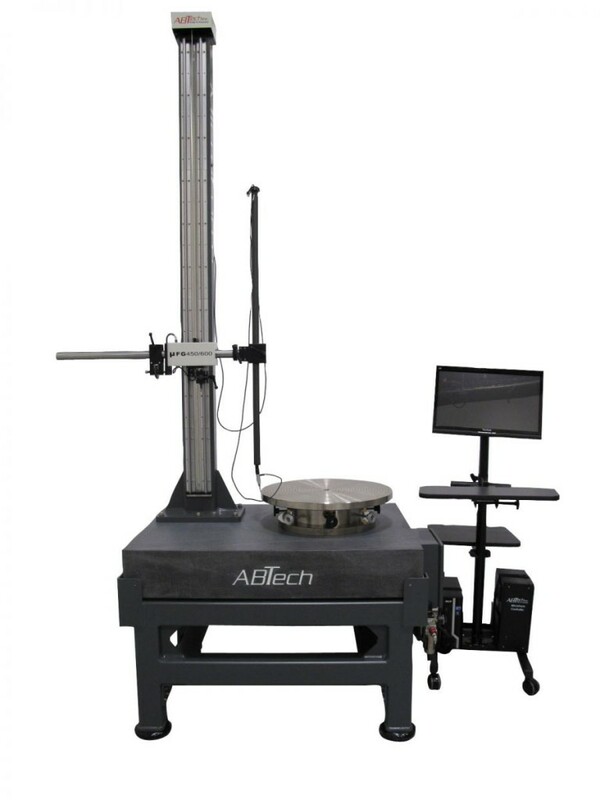 MicroForm gage platforms measure roundness, flatness, concentricity (in and out of plane), parallelism and perpendicularity. Our unique RunOut feature simplifies part alignment and provides quick in-process shop floor checks. 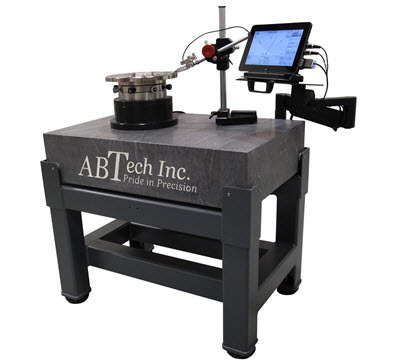 For precise part alignment and to reduce eccentricity errors, gages can be configured with an adjustable Tilt and Center worktable. Currently have a gage that’s functional but isn’t quite cutting it? If you don’t need a new gage we don’t want to sell you one. 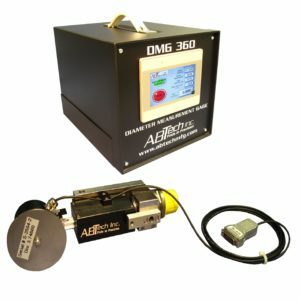 Save thousands of dollars by upgrading your current air bearing-based gage with a new MicroForm controller and software. We’ll also work with you to customize your platform to address unique applications. For more detailed specifications read more in the tabs below or view the datasheet for this product. To learn more about software for this product, view the MicroForm Software datasheet. 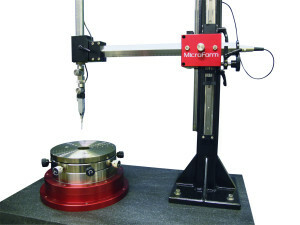 An ultra-precision air bearing rotary axis is the foundation for all MicroForm gages. Combined with a highly responsive lever-type probe that has excellent linear reliability with a correlation coefficient of .9999 (out of a possible 1.0000) over the full travel, our gages carry an overall system accuracy certification better than 5 millionths of an inch (5μ” or 0.125 μm). With no mechanical contacting parts to wear or create drag, air bearings produce virtually no friction. 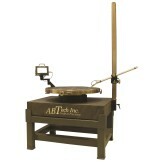 This translates into ultra-smooth, repeatable and maintenance-free operation. Frustrated by frequent measurement errors? Our platforms have engineered out the most common causes of errors such as thermal and/or vibration interference from interference from internal electrical components. The motor drive amplifier, power supplies and other electronic hardware are installed in the MicroForm controller isolating then from the part. Minimal cabling and connectors help reduce electrical interference that could distort your measurements. To maximize thermal and vibration stability, the air bearing is recessed in a granite base and the granite surface plates are mounted on structural steel frames with passive vibration isolation leveling feet. With this robust design, you can be confident that your measurement result is from the part alone, and don’t include “noise” from outside influences. 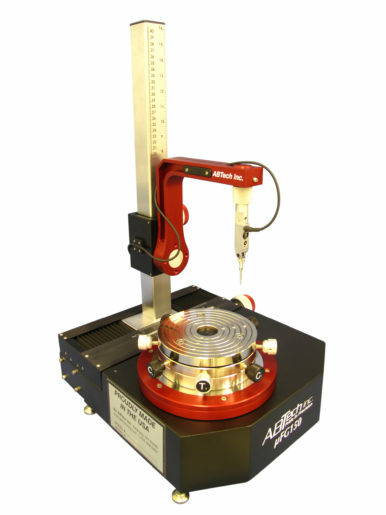 Fine resolution adjustment knobs and visible linear scales on both the horizontal stage and secondary vertical post allow precise alignment of the probe tip to the measurement surface. 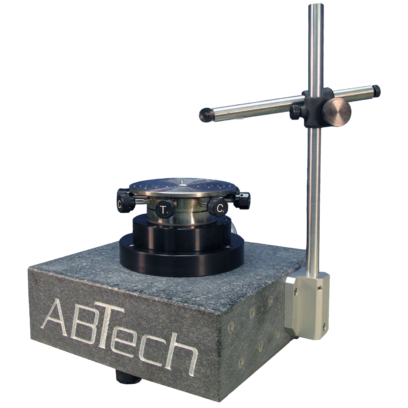 To make multiple surface measurements quicker, an additional portable or fixed gage stand can be mounted on the granite surface plate and a second probe can be added. 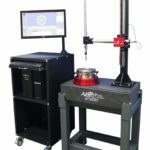 You also have the flexibility to add an optional Tilt and Center worktable with very fine adjustments that allow operators to level and align parts to the bearing’s axis of rotation, reducing eccentricity. 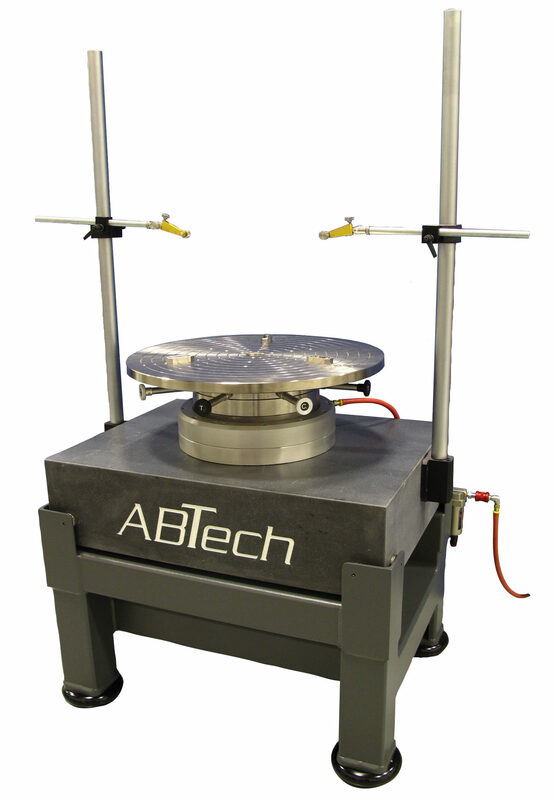 The spherical seat design maintains the part’s center point when leveling, saving you time and frustration in setting up the part for measurement. 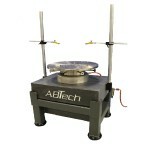 Our mini-towers are counterbalanced for easy motion while protecting the probe and your parts from accidental damage. A secondary vertical probe arm accommodates parts up to 36” in height allowing easy access to ID surfaces in deep bores. And the main tower is encoded so that the vertical position can be captured directly into the MicroForm measurement software. Operators interface with Mircoform gage using a large 22” touch screen. Two simple screens are used to clearly lay out access and navigation. 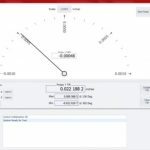 Operators can easily toggle between the main setup screen with its active analog and digital RunOut meters, to the results screen with graphical polar and linear charts. Measurement results and a sidebar menu of all the form options are always visible. Our gages are driven by a “real-time” operating system with dedicated FPGA processing platform and signal conditioners. These are the workhorses for performing the measurement algorithms, eliminating resource conflicts typical with systems running on PCs. 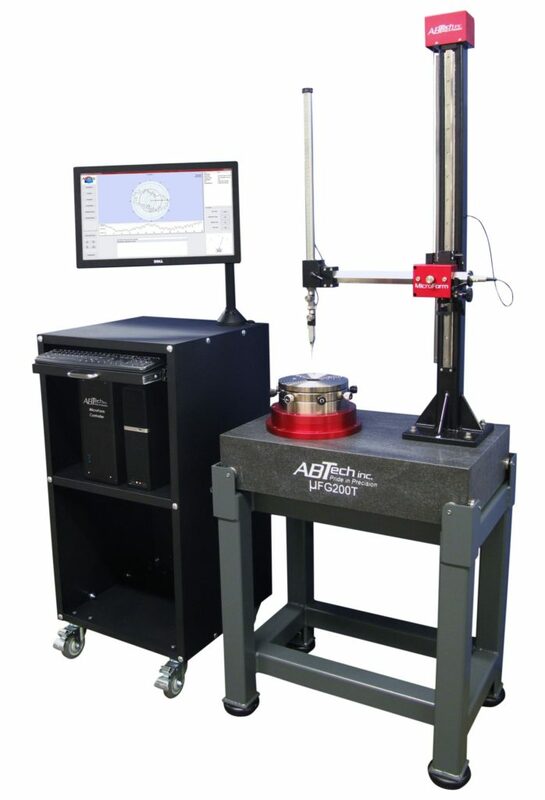 The gage’s dedicated processor results in high speed data acquisition and instantaneously synchronizes the indicator displacement with a high resolution encoder for pin-point accuracy. This powerful processing platform not only provides tremendous system performance but also permits future system enhancements without the cost and downtime associated with hardware obsolescence. 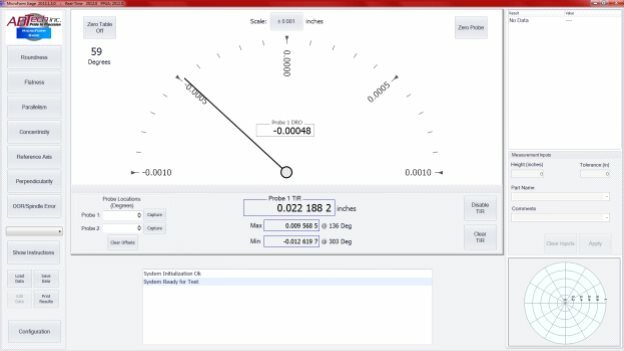 To ensure quick and accurate measurements, surface interruptions can be automatically removed during a measurement or easily edited out using our drag and exclude feature. 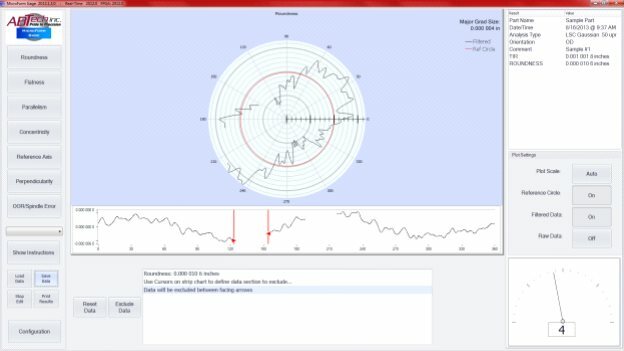 You also have the flexibility to analyze part harmonics (slope and lobing optional) right on the results screen or export the data for statistical process control (SPC). User definable system preferences for customizing output and displays are readily accessible through the configuration button. 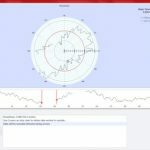 Select from four reference circle types: Least Squares Circle (LSC), Minimum Zone Circle (MRS), Minimum Inscribed Circle (MIC), and Maximum Circumscribed Circle (MCC), Gaussian filter settings, units of measure, and other options to match your part drawing’s requirement. Quickly print or save a PDF file to share the measurement results and graphical charts and document traceability. And each PC includes an Ethernet network card to provide remote file storage and enterprise connectivity. A straightforward interface which increases productivity, streamlines training, and offers the highest degree of operator flexibility. The full functionally is made easy so operators of every skill level can use our gages. The maximized interface accommodates different skill levels with on screen “step by step” instructions that don’t interrupt an experience user. All MicroForm gages offer a dual probe option to enhance the measurement process. All specifications are at 60 psi and subject to change without notice.